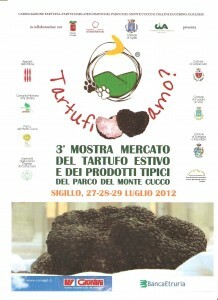 Last weekend, I joined an international group of writers for the Summer Truffle Festival of the Monte Cucco Park. The park straddles the boundary separating the Italian regions of Umbria and Marche in the eastern part of the country, about 70 kilometers from the coast. It rises 1,566 meters (5,138 feet). Alberto Facchini, the dynamo who coordinated this event, is president of a group called Tartufi amo. On the logo, there are two heart-shaped truffles—one black and one white—separating the two words, which mean, “I love truffles.” But if you put the two words together, tartufiamo, it roughly means “We put truffles on things.” I rather like this translation because I think Alberto is the embodiment of truffles. He was everywhere. One moment he was overseeing stalls being set up to display typical products of the area: pecorino cheeses, various types of salami and other cold cuts, wine, and legumes such as lentils and farro. That done, he ferried a group of journalists (including me) up hill and down dale in his Mitsubishi wagon. We forded two streams, bounced along a grassy track, careened perilously close to cliff edges, and made sharp v-turns that required much toing and froing. At one point, we went up, up, up with nothing ahead of us but sky. All of us were screaming like roller coaster riders, even the robust Russian guy. At the end of the journey, we watched our hosts prepare a local bread called crescia (also known as torta di testo). While the bread is common throughout the area, it is usually cooked on a large stove-top griddle, but we saw the traditional method, in the ashes of an outdoor oven. At the official festival opening the next day, Alberto didn’t actually cut the ribbon; that was left to local political dignitaries, but he strung the tricolor and provided the scissors. And the truffles. These had been nosed out by his pack of truffle-sniffing dogs. When the congresso—a symposium about truffles—began, Alberto mounted the podium to offer a welcome and introduced the first few speakers, including leaders from various agricultural groups—especially those involved with truffles, local and regional government officials, academic researchers and others. He disappeared for a while, and I can only guess his motive, but he returned in time to bid everyone adieu and tell us about the Winter Festival, come December. But he wasn’t done. He had awards for many of the presenters, the most impressive going to Fernanda Cecchini, who heads the regional department of agriculture. Through all of this, Alberto arranged incredible lunches and dinners at restaurants known for their use of local products. Every meal featured truffles in each course! Except dessert. After Friday’s dinner, the sommelier decanted a plum cordial to end our meal, and we learned that Alberto had made it. It was superb. Most of the writers departed Saturday evening, and Alberto gave each a package of truffles. I left the following morning, and somehow I got left out of the truffle presentation. Alberto did accompany me to catch my train, so I can only think that he was relieved that the event had proceeded with such success and truffles for me slipped his mind. I am a bit miffed, though. I had imagined trying to recreate some of the outstanding dishes I sampled. I questioned the cooks and chefs at each restaurant to make sure I knew how the dishes were constructed.